Krios is a decentralized advertising platform, where businesses get the chance to collaborate with all needed participant in the industry through the platform. The blockchain based platform is intended to be used as an affiliate & campaign management platform. Advertisers will get the opportunity to connect with promoters that fit their demographics and audience. The project launched their PRE-ICO in November last year, and the main ICO finished mid-May this year. ÌCObench has stated on their page that the project raised over 20 million USD, but this is unlikely. The team refuses to publish the amount that was raised in the ICO, which is suspicious. The development of the project started after the Pre-ICO in November 2017, meaning that the team has had ten months to develop the project. The CEO of the project has a website, which can be accessed here. 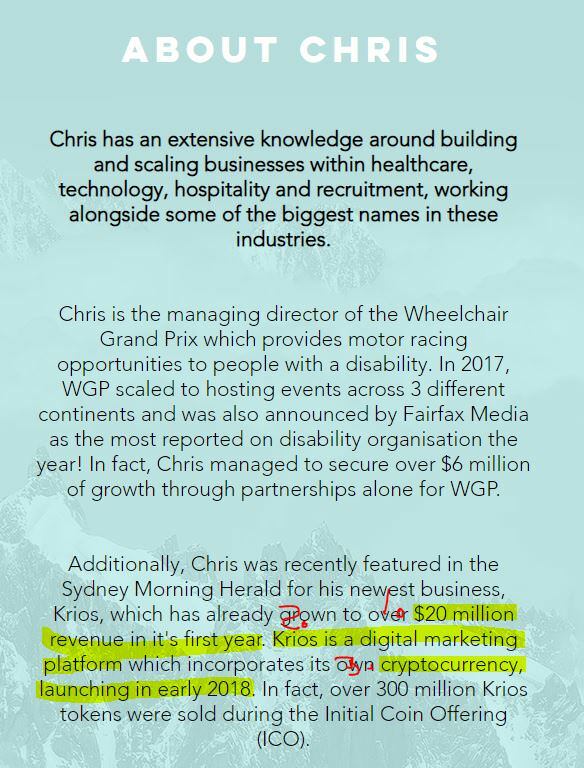 A user on Bitcointalk noted that he had made some very inaccurate statements in the “about Chris” section. It is stated that the Krios platform has received $20 million in revenue in its first year. The platform is not even live, so this is impossible. If this is the amount the ICO received in the crowdsale, the statement is still wrong, as collecting investor funds for a project is completely different from company revenue. 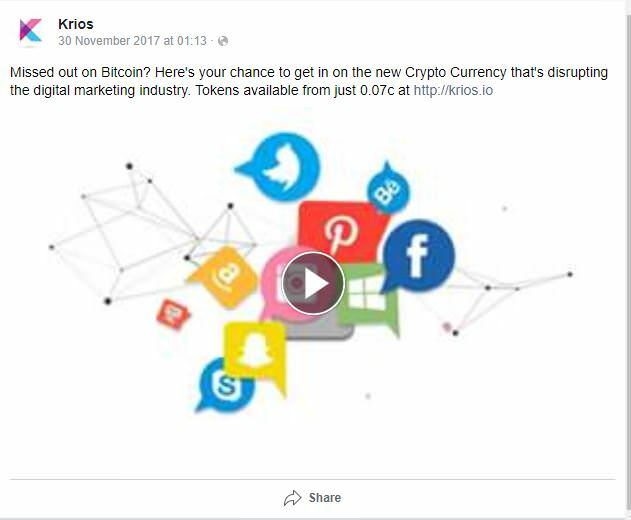 The following Krios AD was shared on Facebook, where it reached over 1.5 million individuals. Instead of giving informative information about the project, the true intension of the AD seems to be to trick naive investors, by making them believe that this is the new “bitcoin” and advertises themselves as the project that was disrupting the digital marketing industry, yet the platform was not even live at that point, and the project was efficiently disrupting nothing at that point of time. The coin is being promoted as a “Crypto Currency” when in reality it is a basic Ethereum token. Additionally, the price is mentioned. Many people who are not familiar with crypto don’t understand the concept of supply in cryptocurrency, a low value is for them an insentive to buy it, as they compare it to Bitcoin, which is worth thousands per token. The ad further claims that the tokens price is 0.07 cents per token, when in reality the tokens cost 0.07 DOLLAR (significant difference). This might be the creators fault for being a bad writer, but still shows huge incompetency for an advertisement that is promoted to over one and a half million people. After the project received a lot of FUD on Bitcointalk because of red flags with the project, the ANN thread was filled with several pages of nonsense from users which clearly had no knowledge of the project. Several BTCT users are suspecting that this is done to suppress the negative attention the project has received. Most likely, this is either targeted paid advertising (people can get people from low-cost countries to post on Bitcointalk, hence the replies that are not making sense (e.g. example in the picture, talking about the ICO when it finished in August). The other option is bots that create automatically generated content. David was one of the most renowned ICO reviewers on ICObench, until he got suspended for violating the rules after it became known that he manipulated ICO reviews for pay and that he sold his picture to ICO projects without actually assisting the projects. It should be said that David Drake also has supported several genuine projects, but having him as the only advisor, when it is known that he primarily contributes with nothing but a well known name to add to projects for credibility while charging enormous amounts for it. The fact that he has been an ICO advisor for over 80 different companies in just a year, clearly proves the point. The KRI token has been delisted from Idex. Medium blog – No activity since ICO launch in January. Pretty much all blockchain projects release their code for transparency. Krios has released no code to the public, and the project doesn’t even have a Github, which may suggest that there is no development. The platform has no need for the KRI token, and the token value is unlikely to ever reach ICO price. Cease and Desist order from NASAA in an operation intended to stop cryptocurrency scams (source). The exchange promised that they would be listed on a top-5 exchange platform after ICO – this never happened. Telegram groups is heavily moderated every individuals raising conserns gets banned. Token price during the ICO was up to $0.1 per token, while the project promised that the post-ICO market price guaranteed would be $5. If you don’t want to read the full article, check out the last bullet point above, as it says it all. When a project GUARANTEES 50x return on investment, it is a scam. It is clear that the projects have a never-ending list of red flags. There is no viable return of invest on this token, and the team behind the project has proved time after time to be dishonest and tricking their investors.